Join Mary Ellen for this new series of classes as you create (and design) a lap-size quilt. Each class will begin with a discussion on color differentiating between light, medium and dark and how to choose your colors for various parts of your quilt. Following this you will learn to piece small, six-inch blocks each of which features a traditional piecing technique taking you back to the basics of quilting. Additionally, you will learn to piece both 12-inch and 6-inch sawtooth star blocks. When all is finished over a period of eight months, you will then choose your own setting and stitch your blocks into your very own lap-size quilt. This class is chock full of information! 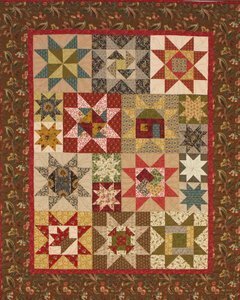 Book/Pattern: Keep Quilting with Alex Anderson A complete supply list is available upon registration. This class fee is noted as $22.00/class. It is also understood that you are attending each class in this series.